Can You Improve Running Performance By Dressing Too Warm? Welcome to our monthly newsletter -- Can You Improve Running Performance By Dressing Too Warm? We hope you enjoy this article and it helps you to improve your running performance! We would also like to congratulate Frank Béraud, our winner of last month's contest! Frank please reply to this email to claim your prize! Also, thank you very much to those of you who have already responded to our survey. If you haven't already completed our one question survey, please take a few moments to do so now. We really want to know about your running challenges and frustrations. Have you ever dressed too warm for running? It can be an annoyance as we want to feel comfortable when we are running. Last week I made the mistake of wearing clothes that were too warm for the temperature that day. I was dressed in layers so I could have easily removed some clothing but that day I decided to challenge myself and run through the discomfort. I thought it would be a good mental challenge, but I also remembered reading about the benefits of heat training, i.e. training in hot weather conditions. I think we can simulate hot weather conditions when we overdress for the current temperature as we feel hotter than we need to be. Later when I was researching heat training, I read about a study conducted by the University of Oregon that tested the benefits of training in hot weather conditions. Two test groups of experienced cyclists participated in the study. "Heat acclimation improves the body’s ability to control body temperature, improves sweating and increases blood flow through the skin, and expands blood volume allowing the heart to pump more blood to muscles, organs and the skin as needed." These test results would certainly indicate that training in hot weather conditions would improve running performance. From my experience, I definitely sweated much more than I normally would. It was a physical challenge but being warm was also a mental challenge that I need to overcome, but I believe any time we challenge ourselves it builds strength, both mentally and physically. "Difficulties along the way are opportunities in disguise; they reflect your expectations. Facing them with surrender helps you follow a more peaceful and perceptive life." It helped me accept that I was feeling warm and that it was ok to be too warm. In the end, I ran the full 14 kms still wearing all the warm clothes. I was pleased with myself, but why would I chose to do this? Why would I intentionally make myself uncomfortable while running? I guess I just wanted to know that I could overcome the discomfort so I could feel more confident about handling other discomforts that may arise while running. And I think we can all use a bit more confidence in our running abilities! I also felt that it was good physical training as I was simulating training in hot weather conditions. I think I will probably try this again the next time I dress too warm for running and hopefully it will help improve my running performance! What about you? Have you challenged yourself lately? Or do you have some great tips to share about how to dress appropriately for variations in weather? We would love to hear all about your experience. Please share in the comments below. 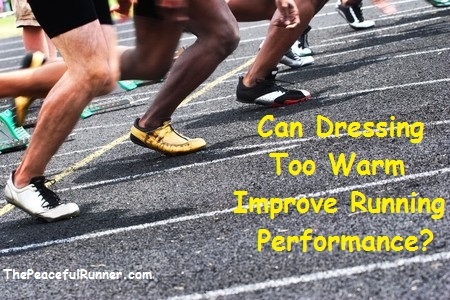 Back to top of Can You Improve Running Performance by Dressing Too Warm?